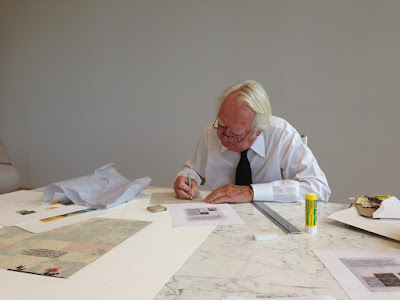 Richard Meier, Pritzker Prize winning architect is known for his international body of work, acclaimed for its timeless, classical, iconic design. Throughout his career Meier has contributed consistently to another, important portfolio- one that is composed of collages, paintings and sculptures. Lichtenstein’s presentation will discuss their five year collaboration in printing making and his experiences working with a world renown architect as an artist. Collectors are invited to enjoy this lively discussion and media presentation of Meier’s master prints. Join us for a discussion that explores the artwork of Richard Meier and Meier’s history as an artist. Gary Lichtenstein is a publisher and printer of limited fine art silkscreen editions. Over the course of his remarkable 45-year career, Gary Lichtenstein has published a wide range of silkscreen editions with artists including Carole Feuerman, Joanne Greenbaum, Bob Gruen, Gerard Hemsworth, Charles Hinman, Robert Indiana, Eugene Lemay, Rebecca Miller, John Newsom, Yigal Ozeri, Gary Panter, Shelter Serra and Jessica Stockholder. He has printed for industry legends including Marina Abramovic, Karl Benjamin, Robert Cottingham, Alex Katz and Ken Price. Pritzker Prize winning architect, Richard Meier is known for his international body of work, acclaimed for its timeless, classical, iconic design. The Barcelona Museum of Contemporary Art, the Getty Center in Los Angeles, Rome’s Jubilee Church, the High Museum of Art in Atlanta, the Hans Arp Museum in Germany are to name just a few. 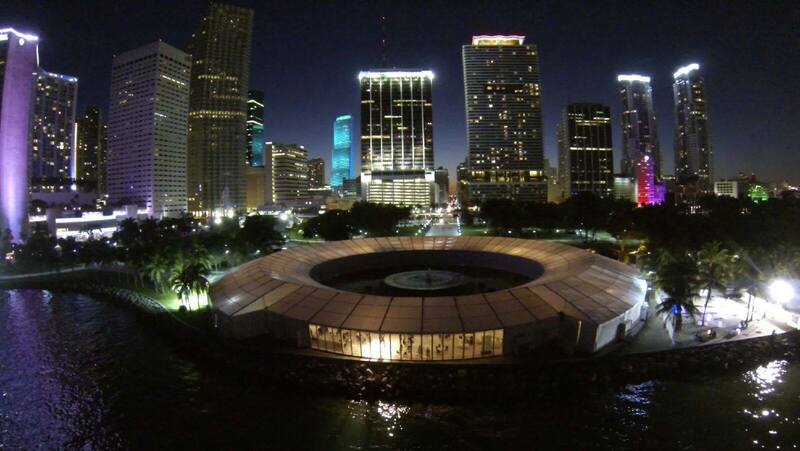 Meier’s newest project includes the remodeling and expansion of Miami Beach’s iconic Surf Club. Throughout his career Meier has contributed consistently to another, important creative portfolio – one that is composed of collages, paintings and sculptures. Meier’s collage work is what brought Lichtenstein into the picture five years ago and since then, the two have been fierce collaborators. Mr. Falk is the founder of Rediscovered Masters (known as redM), which is both an illustrated biographical encyclopedia as well as a curatorial enterprise for presenting significant artists who have, for fascinating reasons, slipped through the cracks of art history. All artists are vetted by its Art Advisory Board. At Concept Fair, redM is presenting The Cuatrecasas Discovery. 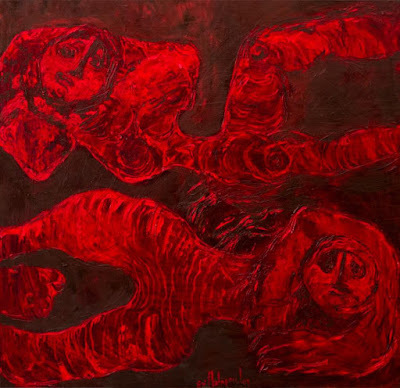 This exhibition serves as a perfect example of the complexities surrounding proper valuation —particularly since this artist’s estate collection was buried for 40 years and is only now being unveiled for the first time at Art Concept Falk’s principles and common sense approach appeals to all levels art collecting. And it applies to young emerging artists to mid and late career to deceased. Mr. Falk is a pioneer in the publishing of art auction indices and was the founding Editor-in- Chief of ArtNet in New York. Since 2000 he has been the U.S. Editor of Artprice.com. He is author and publisher of numerous art reference books, including the national award-winning three-volume biographical dictionary, Who Was Who in American Art. As an expert appraiser he is most noted for having valued the Andy Warhol estate collection as well as Nazi-looted art. How to buy art in an art fair? The Golden Rules in Collecting Art. Sebastien Laboureau will give a presentation on the current trends in collecting and in the art market, outlining the market structure and its dynamics. He will address various topics including the golden rules of purchasing artworks and the advantages of purchasing at art fairs. An experienced investment banker, collector and art advisor, Laboureau shares his professional views on developing collections in the twenty-first century. His presentation will include fair highlights and scheduled collector tours of Concept Art Fair. 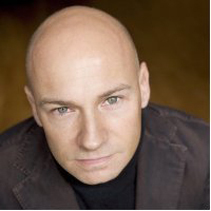 Sebastien Laboureau holds a degree in Civil Engineering from Ecole des Mines de Paris and a Master of Science in Accounting and Finance from the London School of Economics. He benefits from an international experience in Management control (at AXA Group) and Investment Banking (Mergers and Acquisitions at Goldman Sachs). Long-time, art enthusiast and experienced art collector, he is the Founder and Chief Executive Officer of MoonStar Fine Arts Advisors, an independent art consulting agency located both in Miami and Paris, with partners in Latin America and Asia, trusted advisor of private collectors, and various institutions all over the world. 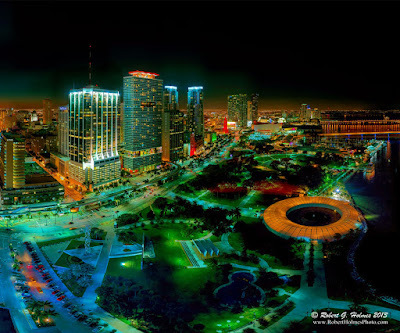 He serves as the Chairman of the Board of Directors of the Arts and Business Council in Miami and sits on the Creative and Design committee of the Beacon Council in Miami. He is the Strategic Art Advisor of Institut Van Gogh, in Auvers-sur-Oise, of ACCOR Group, and of BARNES Luxury Real Estate. 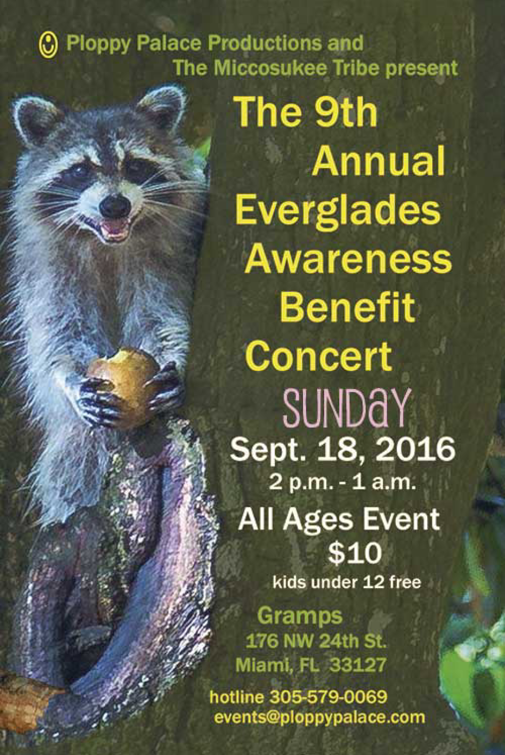 CALL TO ARTISTS --> Love The Everglades Movement is preparing for the 9th Annual Everglades Awareness Benefit Concert at Gramps in Wynwood on Sunday, September 18, 2016. We will be featuring a video slide show with artwork and we are accepting submissions. 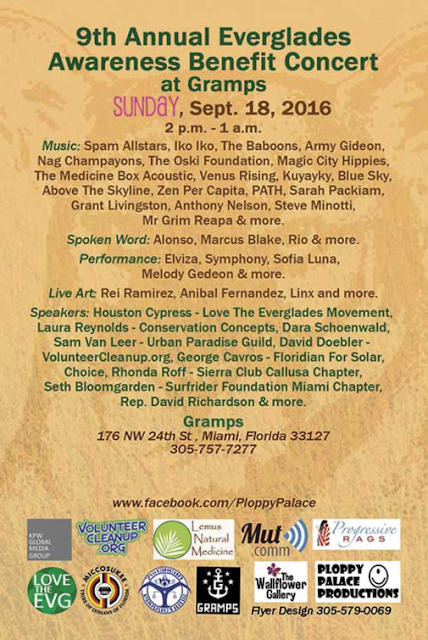 On Sunday, September 18, 2016 Ploppy Palace Productions and Love The Everglades Movement will be hosting a concert to raise awareness and funds for Everglades protection and public education. As part of this three stage extravaganza, some of South Florida's top bands, spoken word artists and community activists will join together to raise awareness for this vital natural resource. There will be musical performances by The Spam Allstars, Army Gideon, The Baboons, Iko Iko, The Medicine Box Acoustic, Nag Champayons, The Oski Foundation, Magic City Hippies, Blue Sky Drive, Above The Skyline, Spank, Zen Per Capita, PATH, Venus Rising, Kuyayky, Rachelle Coba, Sarah Packiam, Michelle Forman Duo, Steve Minotti, Grant Livingston, Anthony Nelson, Mr. Grim Reapa, Haviken Hayes and more. Guest speakers include: FL State Rep. David Richardson, Houston Cypress from Love The Everglades Movement, Laura Reynolds from Conservation Concepts; Rhonda Roff from Sierra Club Callusa Chapter; Dara Schoenwald & David Doebler from VolunteerCleanup.org; George Cavros from Floridian For Solar Choice, Sam Van Leer from Urban Paradise Guild, Seth Bloomgarden from Surfrider Foundation Miami Chapterand other concerned citizens. Spoken word by Alonso, Marcus Blake, Rio and more. Dance and performance by Elviza's Rockabelly Hippies featuring Elviza, Symphony & Sofia Luna plus Melody Gedeon and more. Live art by Anibal Fernandez, Linx, Rei Ramirez and more. Information booths from Love The Everglades Movement,VolunteerCleanup.org and other organizations. Vendors and small businesses promoting and selling their merchandise, including The Wallflower Gallery, Progressive Rags and others. 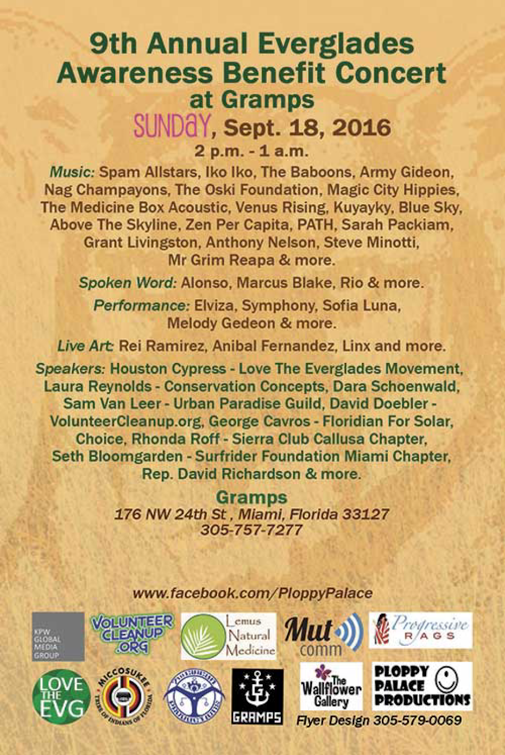 The 9th Annual Everglades Awareness Benefit Concert at Gramps is sponsored by Ploppy Palace Productions and The Miccosukee Tribe of Florida, Dr. Michael Lemus and VolunteerCleanup.org. Production Support by 7th Circuit Productions, Miccosukee Media, Mut Communications and KPW Media. Renowned international multidisciplinary artist Evi Photopoulos is known worldwide for her paintings, public art installations, video art, film, sculpture and more. She is an award-winning artist whose work is widely exhibited throughout Europe and the United States. 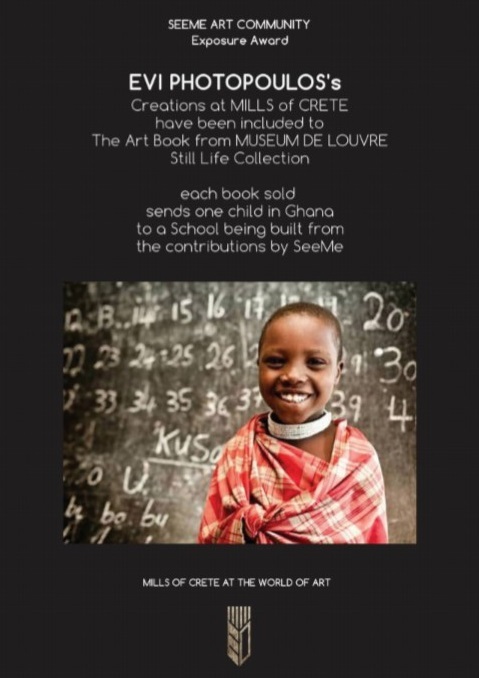 some of her most recent notable achievemnets include her sculpture exhibition Art from Flour creations 'In Mills of Crete', exhibited in the Musée du Louvre 2015 and the works are included in The Art Book Musse Du Louvre Paris, France Still Life Collection. Her oil painting 'Souls in Desperation' was awarded Celeste Prize Winner 2012, and the artist's award-winning Film 'The BLACK WINES of EROS' was spotlighted and won 'Best Short Film' at the Festival de Cannes - Page Officielle & Marché du Film - Festival de Cannes 2016. Calling Artists --> do you require art copy? 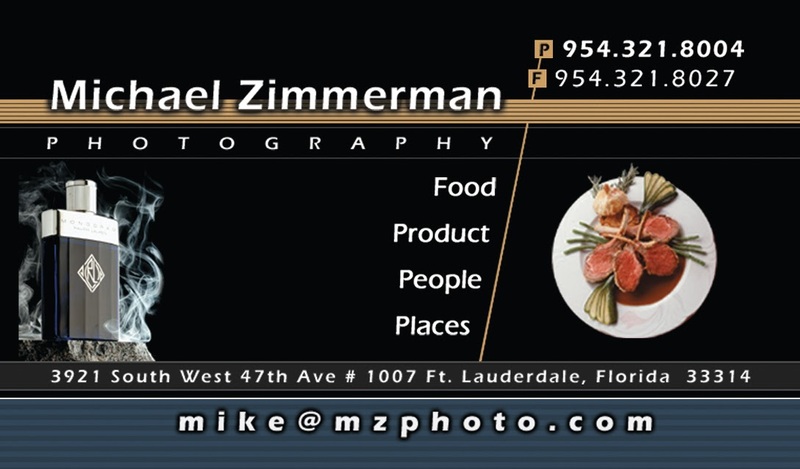 MZ Photo of South Florida produces HIGH resolution digital scanback for art copy work, creating files of 90Mb and higher at 300dpi, without interpolation - and can handle large pieces up to 7ft x 7ft! 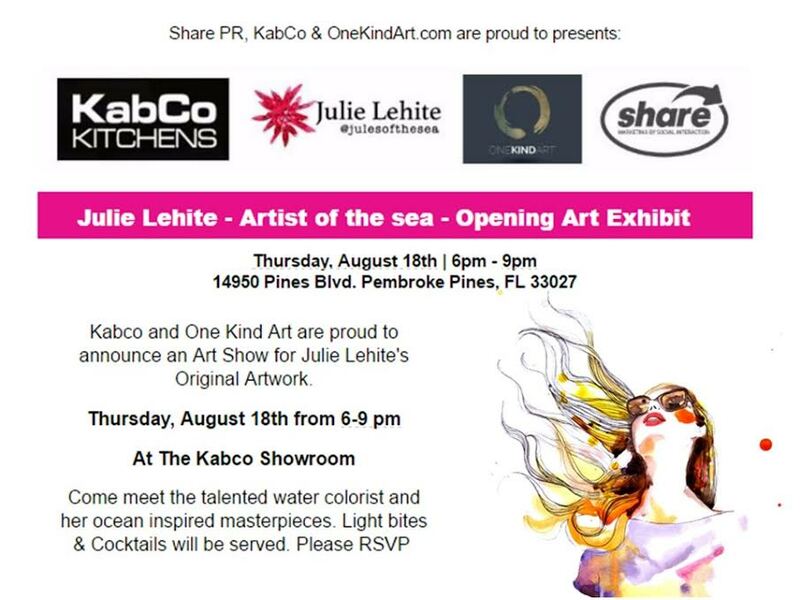 Thursday, August 18th from 6-9pm join us for the opening reception of artist Julie Lehite‘s exhibition at the KabCo Showroom in Pembroke Pines, presented by KabCo and One Kind Art. Meet and greet the renowned Miami-based watercolorist and her ocean inspired masterpieces, enjoy light bites and cocktails – kindly RSVP.